“Hello Peeta…..this is your mother”. This is the way my mother starts her conversation when she calls me on the telephone and leaves a message on my answering machine. How many children are out there that would not recognize their own mother’s voice that she would have to identify herself in that way? Even a lost baby caribou recognizes its mother’s call among a herd of thousands. I don’t get it. My sister has the same habit. But she goes a step further. She’ll say, “hello Peeta….this is your sister….Annette”. I ONLY HAVE ONE SISTER! When I call them and get their answering machine I just say “hi, it’s me” If they don’t know who “me” is after 55 years of hearing my voice, well, they should take a lesson from the caribou. Now, I know my mother recognizes my voice because the one time I downloaded a canned message on my answering machine from the internet I almost had the cops show up at my door. I was living in Hackensack at the time and I downloaded a “Rocky” sound alike on my answering message. It went something like..”Yo….there is no one in right now. ERR…when you hear the bell just talk in the phone….ya know.” I thought it was cool to have that on my answering machine. I never thought in a million years that it would almost cause an Amber Alert! My mother called me that day and got “Rocky” on the answering machine. She hung up! She called back a second time, and again hears “yo, there is no one in….”. She hung up again. Now she got worried. Did she dial the right number? Maybe she used the wrong area code. Did someone break into my apartment and kill me and changed my answering machine message??? Because there was a rash of that going on in the country at the time….especially in Hackensack. I kid you not. This is what was going on in her mind. She finally calls the operator and tells her that “every time I dial my son’s number a stranger answers the phone! Can you please try this number and let me know if everything is ok?” I’m sure Ma Bell operators get these requests every day and are specially trained to deal with these dire situations. The operator dials and gets “Rocky”. The operator explains to my mother that it’s an answering machine that sounds a little slow, like it’s winding down, but it’s the correct number. At that point my mother’s thoughts resemble that of an insane woman. I don’t know what was going on in her head but she thought that something had happened to me. And that someone broke into my home and took over my answering machine. It upset her day. THANK GOD I called her that afternoon or the cops would have shown up. She answered the phone and I said “hi, it’s me”, not knowing what just occurred. I once heard that actions have unintended consequences. And when you least expect it, something very innocent can occur that turns your mother into a lunatic. Maybe it comes out of love. Oh, by the way, the reason my mother called me that afternoon was to let me know her and my father were coming up to visit me over the weekend…..and bringing me stuffed artichokes…. It was worth the aggravation. 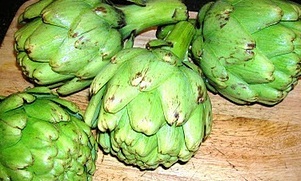 Take off the bottom small leaves of the artichoke and cut the stem off so the artichoke sits flat. I save the stem and cook with the artichoke. Just cut off the “woody” outside layer of the stem. Rinse the artichoke in cold water. Shake off any excess water. Cut off about 1/3 of the top. A serrated bread knife works well here. Now open the leaves by spreading with your fingers or turn upside down with the top of the artichoke on top of the counter and with your palms press down hard to open the leaves. Now the artichokes are ready to stuff. To the bread crumbs add the grated cheese, chopped garlic, chopped parsley, salt and black pepper. Mix well. With a teaspoon, stuff each leaf of the artichoke with the bread crumb mixture. Holding the artichoke in one hand, pull the leaves back with your thumb and spoon in the bread crumbs and shake till they settle to the bottom. Go all around the artichoke and make sure each leaf is filled from bottom to top with the mixture. When every leaf is filled place the artichokes in a large enough pot to fit. There is no measurement here, slowly drizzle the extra virgin olive oil over each artichoke until absorbed by the bread crumbs. For 4 artichokes you can easily use 3/4 cup of olive oil. Fill the pot with water about a quarter of the way up the artichoke. Do not pour water over the artichoke. Turn the heat to medium and bring to a boil. Turn down heat to low and simmer with the lid partly covering the pot. Check the pot from time to time and add more water as needed. Pour the water into the pot, but not over the artichokes. They should cook about 50 minutes or until you are able to pull a leaf from the center easily. For those of you that have never eaten an artichoke before here is how to do it. Pull off a leaf. With the bottom inside of the leaf against your front bottom teeth, bite down gently and as you pull the leaf out of your mouth, scrape the fleshy part from the leaf. As you get closer to the center of the “choke”, the leafs will be more tender and you will be able to eat the softer bottom parts of the leaf. When you get to the center scrape off the “hairy” part till you get to the heart of the artichoke. That is my favorite part! Including the stems you cooked with the artichokes. These are best eaten at room temperature or slightly cooled. They also travel well. This entry was posted in vegetable and tagged Artichokes, bread crumbs, Stuffed artichokes, the best stuffed artichokes. Bookmark the permalink.